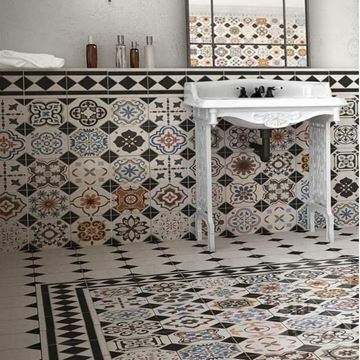 Ceramic floor tiles are a brilliant and classic way to finish a room. Beautiful to look at, especially when matched with the rest of the room décor, ceramic tiling is the durable, long-lasting option with the most variety. Compared with other flooring options, like wood, ceramic tiles offer infinitely more when it comes to colours, patterns and shapes. Here at Tile Town, our ceramic tiles are made from the perfect blend of clays and silicones pressed into shape and then fired in a kiln to produce tough, hard-wearing tiles that are resistant to water, spillages and stains. They’re finished with a clear glass glaze to give your floor the high-quality sheen it needs to bring out the best in your room. Due to the natural properties of ceramics and glass, this method of finishing your floor is perfect for rooms which may get wet or dirty. They don’t require any sealing or polishing and are easily wiped clean – ideal for floor tiling in bathrooms, kitchens, hallways and conservatories. 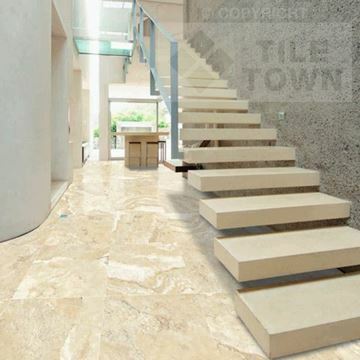 If you’re going for a more natural or less uniform look for your floor, then Tile Town absolutely has got you covered. 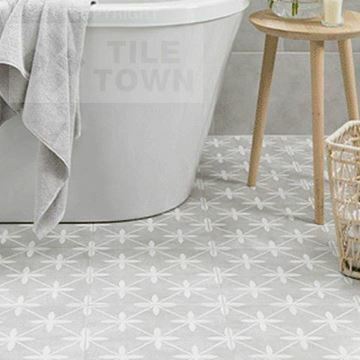 Advances in Inkjet technology has made it possible to give each tile a unique look, so that your floor won’t just have a repeating pattern. This kind of non-repeating pattern really works for the more natural-looking designs, such as our Almansa Black Floor. We have an enormous range of colours and finishes available for you to peruse. Everything from your more understated beige, cream and ivory, to the more adventurous white, green and even mixed coloured tiling. We choose our suppliers carefully – we will only ever sell you the highest quality ceramic floor tiling from the top manufacturers in the industry. Pricing options range from just under £14 per square metre, for the Sherwood range of floor tile all the way up to £30.35 for the truly magnificent Mercaston Grey Floor Tile. 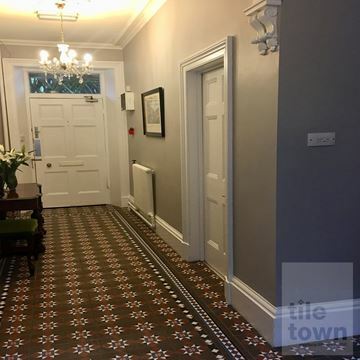 Go for this tiling if you want a striking feature floor. Our Chatsworth range is your options if you want clear and bold patterns to really make your floor stand out. But, if you want a more subtle and understated look for your floor, Tile Town’s range of stone effect flooring is the way to go. Along with the stone effect tiles, we’ve also got a fantastic selection of wood effect ceramics, if you desire a classic look for your floor, with none of the drawbacks of genuine wood. The Sherwood range of ceramic tiling offers all the aesthetic benefits of wood flooring, in a variety of colours ranging from light and airy to dark and stylish. 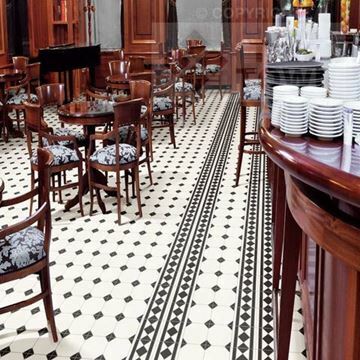 Flooring like this demonstrates our commitment to all there is in terms of designs and choices for ceramic floor tiling. We’re passionate about the possibilities that ceramic tiling offers and we hope our enthusiasm comes out in our work as tile suppliers. We’re so proud of our selection, so please take a look – we’re confident that you’ll find your perfect ceramic flooring today.